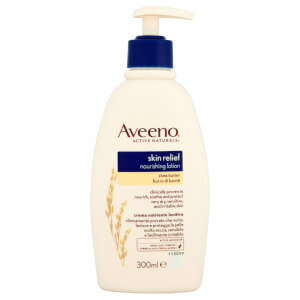 Catering specifically for dry skin, the Aveeno Skin Relief Moisturising Lotion instantly soothes and relieves itching and irritation for long-lasting comfort. Utilising cooling Menthol and naturally active, finely milled Colloidal Oatmeal (the brand's signature ingredient), the lightweight, quick-absorbing lotion delivers superior hydration, whilst helping to restore the skin's natural protective barrier. 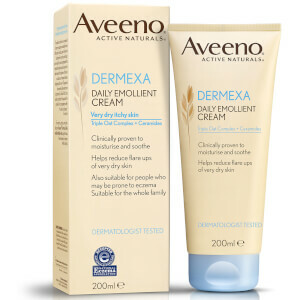 The body feels smooth, calm and moisturised without greasy residue. Je nach Bedarf täglich auftragen. [PR- 006249] Aqua, Glycerin, Distearyldimonium Chloride, Petrolatum, Isopropyl Palmitate, Paraffinum Liquidum, Cetyl Alcohol, Dimethicone, Avena Sativa Kernel Flour, Menthol, Allantoin, Cera Microcristallina, Stearyl Alcohol, Myristyl Alcohol, Isopropyl Alcohol, Sodium Chloride, Paraffin, Benzyl Alcohol.